With it being currently being it’s 50th anniversary, a new movie recently released, and a new TV series revealed, Star Trek is quite a popular topic at the moment. 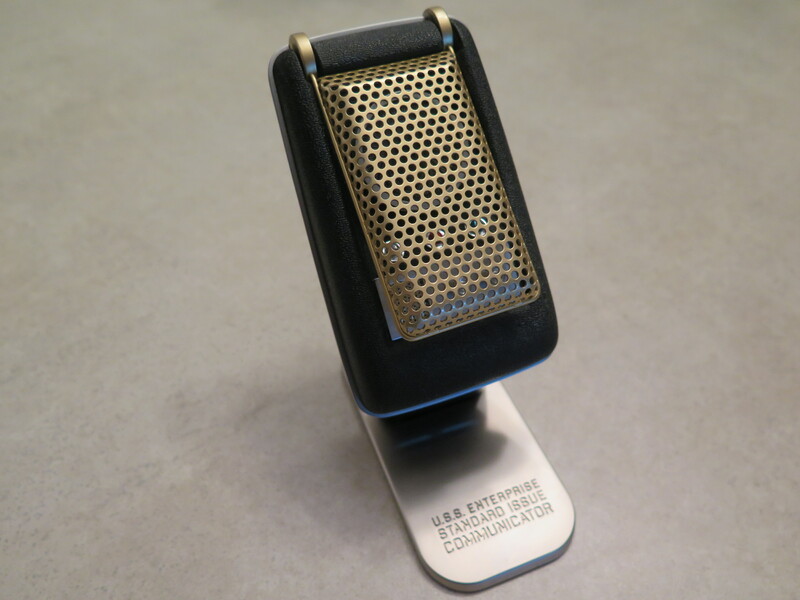 With all the excitement, The Wand Company has released something that fans of the original Star Trek series have been patently waiting for the past half century; a fully functional Communicator. 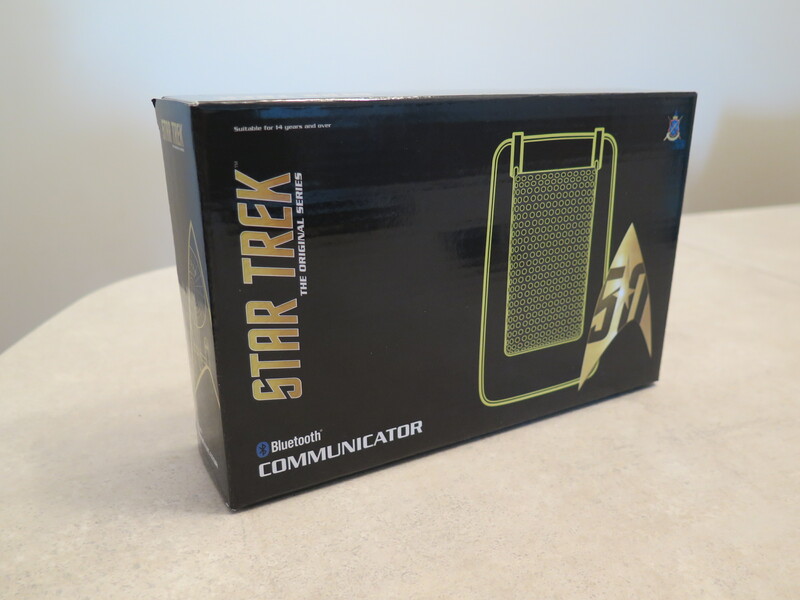 While there have been Communicator toys in the past, they all fail in comparison to this. Not only is this probably the closest you can get to the original prop used on the show, but it actually communicates (via Bluetooth with your phone). 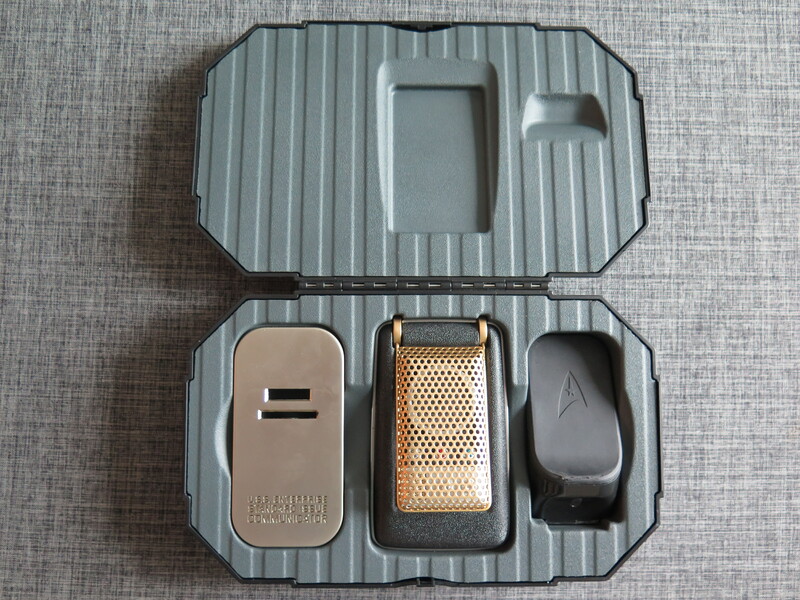 The entire presentation of the communicator is really nice. Once you crack open the box, you will pull out a very official looking case. 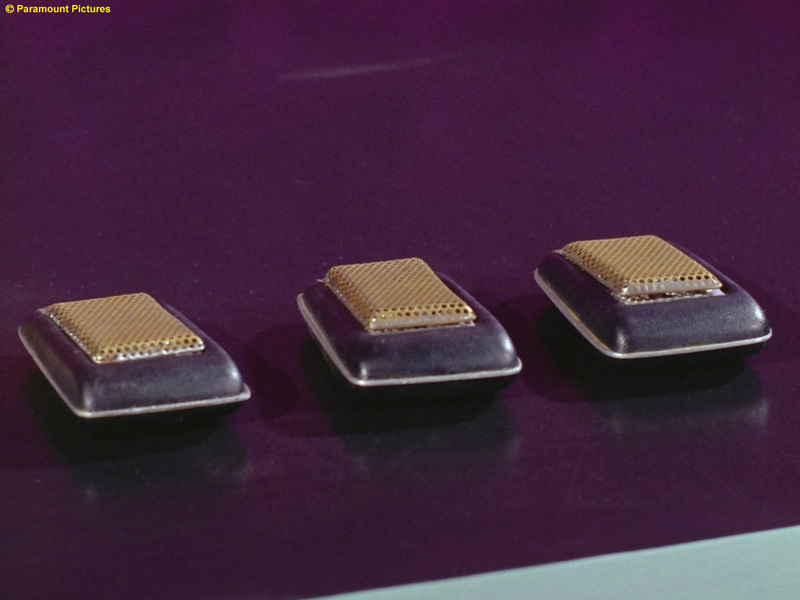 Opening that, you are presented with 3 main items: a base, a charging cradle, and the communicator itself. Looking closer, you will also find a micro USB cable included, and a protective leather pouch, which also looks very official. 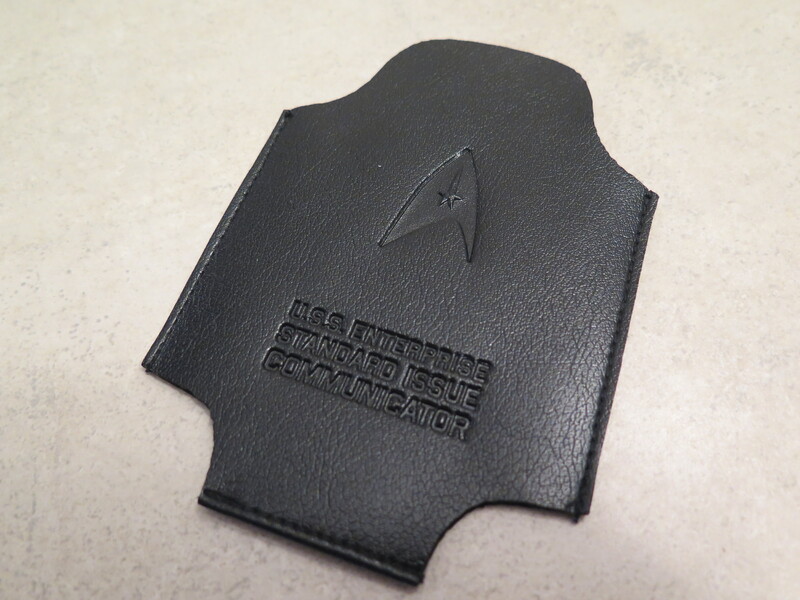 However, I did find that it did serve no other propose than protecting my communicator. It would have been nice if it could be attached to my belt, for example. Also included in the original box is a paper insert thanking you for your purchase, and also a little reminder reminding you that the left button on the communicator is not a jog switch, and using it as such can result in damage to it. There is also a pamphlet included that shows you how to set up and use the communicator, as well as a nice poster on the other side. 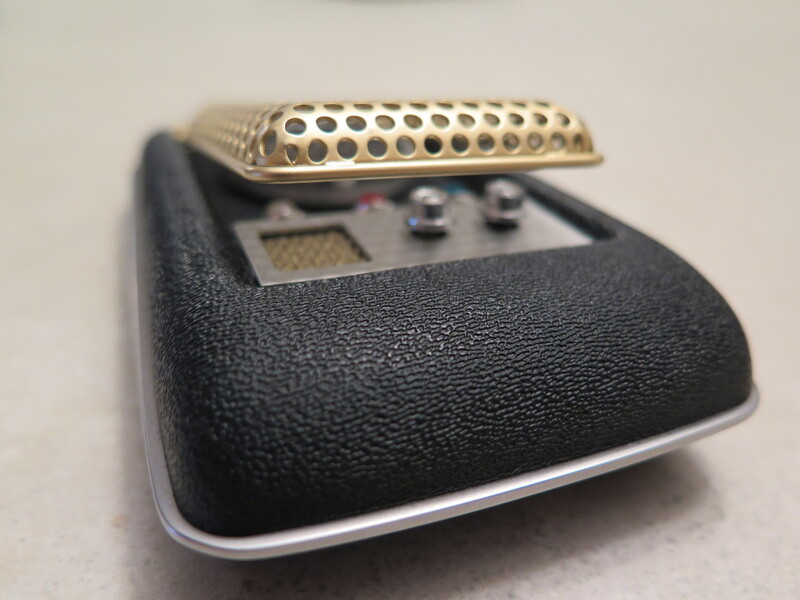 The attention to detail on the communicator is remarkable. The Wand Company used 3D scans of some of the original props from the show to make this. All the dimensions and sizes are the same. Flipping the grill open plays the iconic sound from the original show, which also reveals the same spinning optical illusion, only this time, instead of being run by a 30-second stop watch, it’s run by a electric motor. You can’t hear it unless you put it up to your ear and listen real closely. It still spins for thirty seconds! The only inaccuracies I found with it was the product information on the back, which is required by law, (and even then, there are three references to the show, which makes it slightly more tolerable), and I found the right indicator light was more blue than the original olivine colour as on the original prop. Just to show how much this is like the original prop, take this for example: About a day or two after using it, I noticed that the front of the grill had started to light and develop a slight bend. I thought that this may have been due to a manufacturing error, but as I did more research on the original prop, I noticed that the original props had the exact same bend! So as a prop, this is extremely accurate. 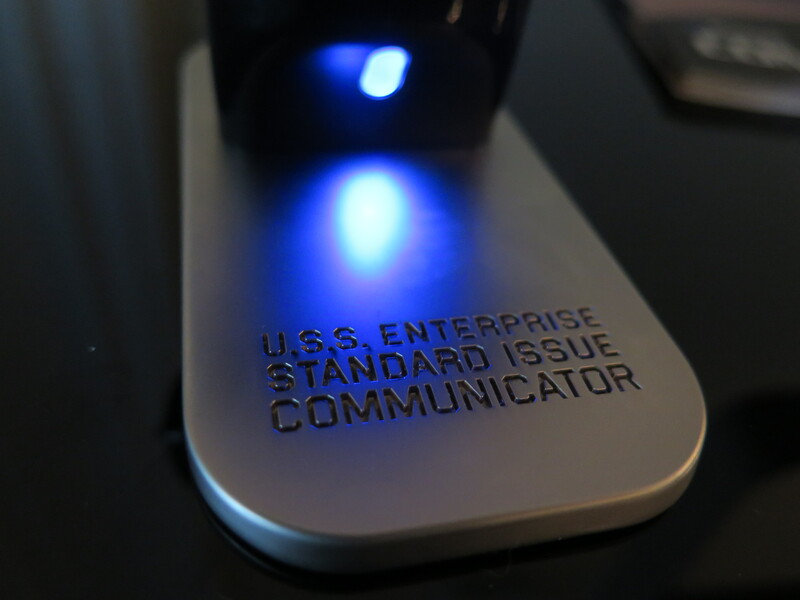 From the standpoint of looking at the communicator as a government issued 23rd-century gadget, however, I hardly see that it would ever develop such a thing. 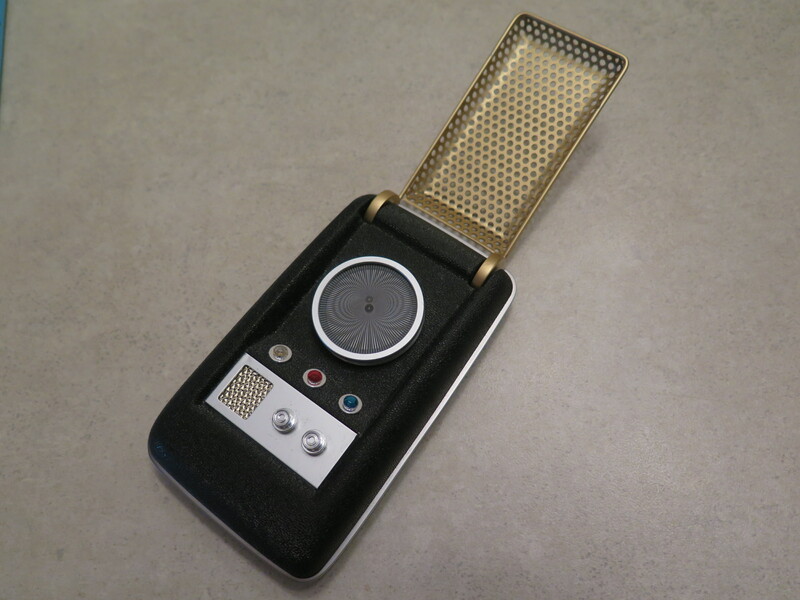 The communicator has improved from the original prop in some ways too. For example, the three indicator lights were not centred on the original. This has been fixed on The Wand Company’s version. To turn the device on, hold down the left button. To connect with your phone, simply hold down on the right button, and you can connect your iOS device to it in the Bluetooth settings. Once that is done, you can press the right button once to activate Siri. Holding it down while connected will redial the last number you called, and double pressing it will toggle audio playback. The right button is also a jog switch. You can push up, down, left, and right to play sound clips from the show. It should be noted that if you are going to be using it for a cosplay or other events of the sort, that it assuming that you are playing the role of the captain, as William Shatner’s voice is not present. While music is playing, you can use the jog switch to change songs and adjust the volume. It all works really well. But it’s not perfect. For starters, I do not like that the communicator announces before or after certain actions are done. For example, when I invoke Siri, before it lets me talk to her, it says “Voice Command”. Not only is this unnecessary, as I will be able to know when I activated Siri by the chime, but it also makes it take longer before I can start to talk, which I found rather annoying. It also does the same for when I end a call, announcing “Communication Terminated”. Not only was this not on the original show, but it could be easy replaced by a simple pattern of lights, as the lights are clearly seen even when the grill is closed. It also announces that at other times too. I noticed it did it after a video was done being played in the Messages app. It could be fixed simply by removing it altogether. It is very fun, however, to flip open the grill to answer a call, and to close it to end it. It’s feels quite similar to a flip phone. The audio is good on it too, for both the microphone and the speaker. I found the speaker just a tad bit quieter than my iPhone 5S’. It’s a shame that it wasn’t really loud, because then it would be a lot more justifiable to bring a secondary device with you as a Bluetooth speaker. The only time I could see it being more practical than pulling out your phone would be if you were doing a FaceTime audio call on your iPad, so you could have your tablet in a backpack let’s say, and the communicator in your hand. 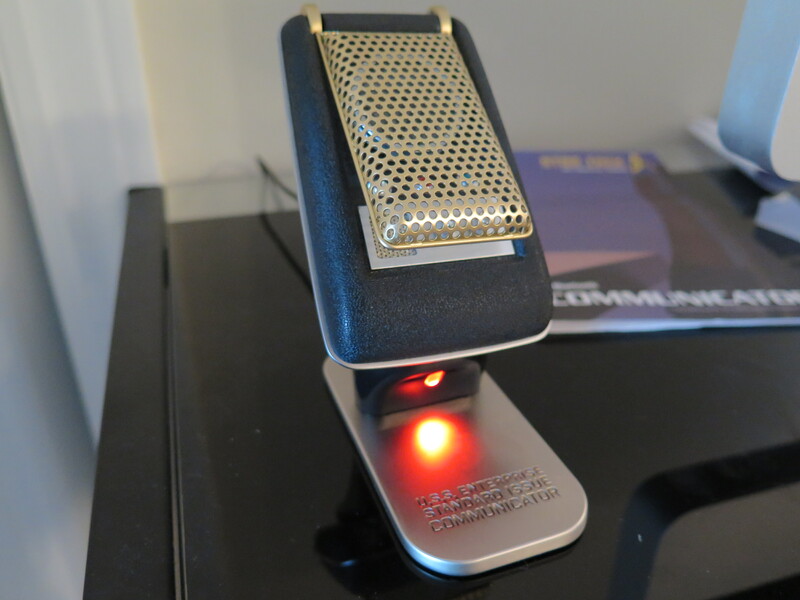 The Communicator uses Bluetooth, so it can’t make phone calls without being in range of your phone. Charging the Communicator is quite literally a snap. 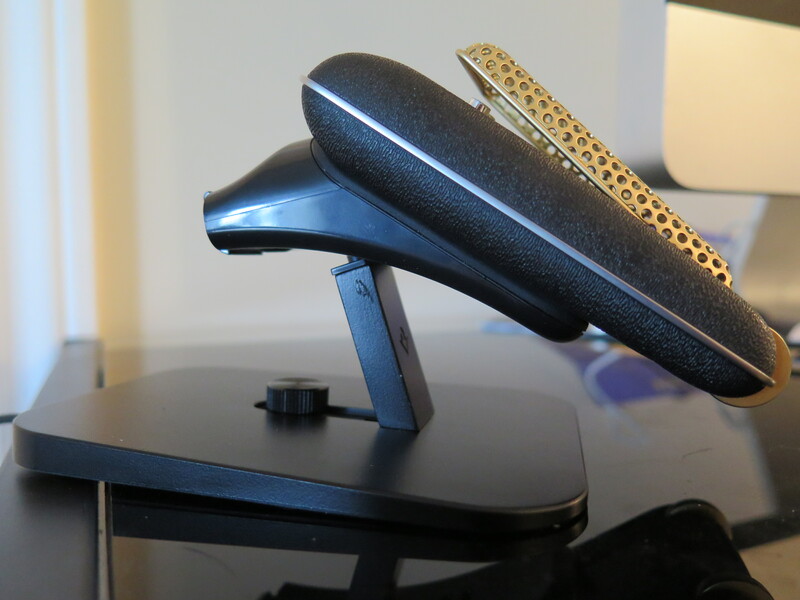 Using the charging cradle and magnets, the Communicator simply snaps together to the dock when it gets close and starts charging. The LED on the cradle slowly pulses from red to orange when it’s charging, and from green to blue when it’s complete. Leaving it on the dock for extended periods of time also has no effect on the battery life. And since the charging cradle uses Micro USB, you can use any cable you have lying around. It even worked on my recently reviewed “HiRise Deluxe” dock (although admittedly it didn’t look that nice). And I never had to worry about the battery life on it; The Wand Company says it has days of battery life, and I found this to be quite accurate. I did notice that the charging cradle did wear out a bit after some use, but not significantly, and it never affected the functionality of it. Unfortunately, with a price tag of $150, it is more reserved for Trekkies and people with large budgets. It’s a shame, because the communicator is a lot of fun to use. But with the inconvenience of tagging along another device that doesn’t add much functionality, it’s hard to recommend to mainstream buyers. However, if you fall into the previously mentioned categories, you will most likely be very satisfied with your purchase. You can pick up the Communicator from a variety of different places. You can visit The Wand Company’s official website to find the best option for you. This is Logan with iOSHacker, out.